Blowout Sale! 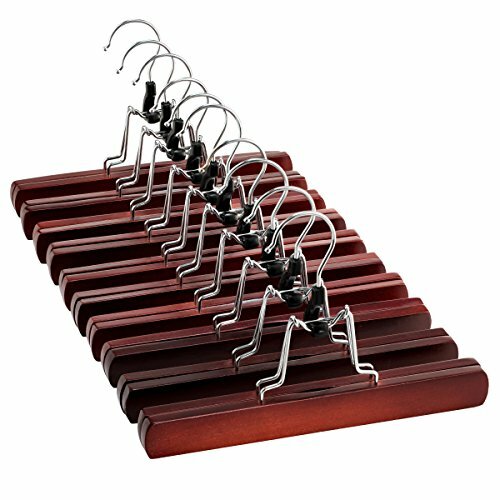 Save 65% on the ZOBER Premium Wooden Pants Hangers (Set of 10) Solid Lacquered Non Slip Trouser Hanger, Cloth Safe Lock Skirt hangers, 360 Degree Swivel Hook, for Skirts, Pants, Jeans, Slacks, Shorts, (Cherry Wood) by ZOBER at Enria Industries. MPN: ZO-W402. Hurry! Limited time offer. Offer valid only while supplies last. Space saving hangers slim body takes up less surface area for maximum use of closet space. Wooden pant hangers dimensions 9 ¾" L x 6 ½" H ( 10 pack ).